Watson, Richard T.; Boudreau, Marie-Claude; van Iersel, Marc W.
This article contains rendered mathematical formulae. You may require the TeX All the Things plugin for Chrome or the Native MathML add-on and fonts for Firefox if they don't render properly for you. Greenhouse agriculture is a highly efficient method of food production that can greatly benefit from supplemental electric lighting. The needed electricity associated with greenhouse lighting amounts to about 30% of its operating costs. As the light level of LED lighting can be easily controlled, it offers the potential to reduce energy costs by precisely matching the amount of supplemental light provided to current weather conditions and a crop’s light needs. Three simulations of LED lighting for growing lettuce in the Southeast U.S. using historical solar radiation data for the area were conducted. Lighting costs can be potentially reduced by approximately 60%. In January 2007, the first two authors of this article started a project to link information systems (IS) scholarship to ecological sustainability. They were concerned that IS scholars were paying minimal attention to global warming and that they did not consider it a problem worthy of their attention. While leading scientists were calling for their peers to spend 10% of their time solving the existential threat resulting from the burning of fossil fuels, IS scholars were generally ignoring the issue. Consequently, this important problem has remained a marginal IS research topic. Since 2010, we have advocated for academic leaders (journal editors in particular) to embrace environmental sustainability as a core principle in the research they publish (Watson et al. 2010); the emergence of this journal constitutes a critical step in engaging more scholars in solving the problem of our time. The project to engage IS scholars in sustainability scholarship resulted in a proposal to create "energy informatics" as a new field of IS research. Leveraging the energy informatics framework, we produced a case study on how one of the world’s major logistic companies was applying the principles to reduce energy consumption and advance sustainability. Energy efficiency, the invisible fuel, reduces the demand for fossil fuels and thus contributes to carbon emission reduction. The energy informatics framework identifies the central elements of an energy supply and demand system, including the key stakeholders, the three major eco-goals, and the major social forces influencing an energy production/consumption system. The framework directs attention to flow networks, sensor networks, and sensitized objects, as these are the source and destination of the necessary data inputs and outputs to advance energy efficiency through the use of information systems. The framework arose from reviewing many energy production/consumption systems, such as traffic congestion management and building energy management. The principal observation is that economies consist of flow networks (e.g., cars, water, people, packages, containers) that consume energy. The management of the energy consumed by such flows requires sensor networks to provide digital data streams reporting on the current status of the flow network so that high quality decisions can be made about the status of sensitized objects that can control the flow network. Actions might be as simple as turning off a valve supplying hot air to a work space. They may also be remotely controlled, such as in the management of hundreds of traffic lights to reduce city traffic congestion. The original energy informatics framework has proved robust because it identifies the main components of an energy flow network and the means of controlling them. It highlights the central role of an information system, linking the interdependencies between supply and demand and the major components (i.e., flow networks, sensor networks, and sensitized objects). The energy informatics framework has been applied to multiple domains, such as road pricing, farming, logistics, bicycle sharing, and others. Recently, we have applied this framework to another major existential problem: food security. Food security is a critical problem that demands the attention of IS scholars, as well as horticulturists, agricultural scientists, and others concerned with food production. Over the next 30 years, the world’s population is predicted to grow by up to 34%, and urbanization will increase by around 20%. To feed this wealthier and larger population, food production must increase by an estimated 70%. Achieving food security by minimizing variations in supply and adjusting to the growth in food demand presents many challenges that will likely require a major adjustment in current agricultural practices. Food security could be enhanced by reducing personal meat consumption and shifting to a predominantly vegetarian diet, but this would require significant behavioral changes to well-established customs and practices. Our focus in this research is on modifying agricultural practices rather than promoting behavioral change. Controlled-environment agriculture (CEA), such as indoor farms and greenhouses, is a key path to increasing food production. CEA can produce up to 20 times as much high-end, pesticide-free produce as a similar-size plot of soil but requires electric lighting to do so. Such facilities will be necessary to meet the future demand for quality fruits and vegetables, particularly in China with its rapidly growing and large middle class. In 2016, the CEA market was dominated by Europe, Middle East, and Africa (EMEA), following by the Americas, and Asia Pacific, with percentage shares and values of 62%, 23%, and 15% of a market valued at USD 20.25 billion. The Netherlands, Spain, and Italy dominate EMEA production; in the Americas, horticulture is mainly in North America; and China has been growing rapidly with more than one million greenhouses. The smart greenhouse is emerging as a solution, offering various collections of integrated technologies in a greenhouse, to improve the productivity of CEA. The smart greenhouse vision is based on sensors, actuators, and monitoring and control system that can optimize plant growth and quality, as well as automate the growing process. This market was valued at approximately USD 680.3 million in 2016. With a short-term compound annual growth rate of around 14.12%, it is expected to reach approximately USD 1.3 billion by 2022. At this stage, the smart greenhouse market is about 3% of the world market. The greenhouse industry’s current practices can require considerable energy to power electric lighting to maintain plant growth on overcast days, so as to meet production schedules. Electricity for lighting can make up to 30% of the costs for greenhouses. Currently, many commercial greenhouses use high intensity discharge (HID) lights[a], which have high output, cover wide areas, and emit high heat. These lights have timers or automated control systems that use sensors to turn on all lights at full power when natural light levels drop below a predetermined intensity, even when only a fraction of the light might be required to reach a crop’s needs for growth. In the extreme, some growers might leave the lights on full power for a substantial portion of the day (as most plants need between 12 to 18 hours of light per day, depending on the species). This approach to growing crops is inefficient, resulting in energy waste, higher operational costs, and often unnecessary carbon emissions. Prior research to reduce CAE electricity costs by making greenhouses smarter has produced a variety of "branded" solutions. Intelligrow, DynaLight, and DynaGrow are successive developments of software for optimizing greenhouse production and minimizing energy costs. DynaGrow, the most recent and advanced of cumulative research in Danish greenhouses, applies multi-criteria methods to control a greenhouse’s climate. The solution has been physically implemented through software and associated sensors and actuators within a greenhouse and produces savings of 64% with LED lighting, the concern of this article. The study reported in this article differs in several ways. First it is a simulation rather than a physical implementation. A key purpose is to identify the savings generated by adaptive LED lighting and what form of software as a service (SaaS) might be economically viable. Simulation enables inexpensive consideration of alternatives. Second, there is a single objective of minimizing electricity cost subject to ensuring that a crop receives sufficient light each day to meet growth needs for on-time contract delivery. This research, like the Danish stream, is based on current knowledge of plant physiology. Plants grow by converting photons (sunshine or supplemental lighting), water, and CO2 to sugars[b] and oxygen. The environmental conditions and physiology of each plant determine the rate of photosynthesis. For the purposes of this research, we can think of a plant using photons to transport electrons. In the light reactions of photosynthesis, photons are absorbed by photosynthetic pigments, and the energy is used to transport electrons. This electron transport then results in the production of chemicals required for the synthesis of sugars. The electron transport rate (ETR) is a direct measure of the light reactions of photosynthesis in response to photosynthetic photon flux (PPF) (Fig. 1). ETR is the driving force for photosynthesis and ultimately crop growth. Both ETR and PPF are measured in micromoles[c] per square meter per second (μmol m-2 s−1 of electrons and photons, respectively). The efficiency of the conversion of the energy of photons into electron transport varies by plant species, but in general we can represent this relationship as a saturation curve of the form ETR = a. (1-e(−b.PPF)), where a and b vary by species. The fitted saturation curve for lettuce illustrates the nature of this relationship (Fig. 1). As the saturation curve shows, conversion of photons into electron transport is most efficient at low levels of PPF, which is an important consideration when electric lighting is used. Essentially, low levels of lighting for long periods are more energy efficient than high levels for short periods. Furthermore, supplemental light provided when sunlight levels are low will be used more efficiently than supplemental light provided when sunlight levels are high. A plant needs to transport a threshold number of moles of electrons per day to optimize its growth. This is particularly important for commercial crops, which are usually grown under contract with a scheduled harvesting date and defined delivery volume. Based on experiments at the University of Georgia, it has been determined that lettuce, for example, needs to transport approximately 3 mol m−2 day−1 of electrons. On a typical day, this rate of electron transport requires approximately 18 mol of photons m−2 day−1. This is close to the recommended daily light level for year-round production of high-quality lettuce of 17 mol m−2 day−1. Supplementary lighting typically lacks intelligence and can be left on continually during the hours of operation, if not for an entire day. This means that energy can be wasted by providing more photons than a crop needs to optimize its daily growth. A recent development in the context of commercial greenhouses is the replacement of HID lights with LED technology. LED technology has many advantages, such as smaller size (and thus easier to mount) than its HID predecessor and it is more energy efficient. More importantly, LEDs can be designed to produce light in the part of the spectrum that drives photosynthesis (400–700 nm), without producing infra-red radiation (which is not used for photosynthesis). LEDs are also fully dimmable, unlike HID lights, thus allowing growers to precisely control how much supplemental light is provided. For an LED light, the relationship between energy consumption and photons generated is essentially linear, and we so assume in this research. Leveraging this kind of lighting, a local company, Phytosynthetix[d], collaborated with the University of Georgia’s Horticultural Physiology Laboratory to develop an innovation that could be transformative to the industry: adaptive LED lighting, which uses a built-in light intensity sensor to determine how much supplemental lighting to provide when natural lighting falls below a crop’s threshold needs. Adaptive lighting provides just enough light to assure optimal crop growth and reduces electricity use compared to conventional control algorithms. The amount of supplemental light to provide can be based on the crop’s physiological ability to use that light efficiently (see Fig. 1). This is an important innovation in greenhouse production as none of the available similar solutions take into consideration both natural light levels and crop-specific light use efficiency. The value of adaptive LED lighting can be increased by the application of energy informatics principles to manage the lighting system to minimize electricity costs while meeting schedule constraints. The CEA version of the energy informatics framework (Fig. 2) incorporates all elements of an energy supply and demand system for greenhouses. We have taken the basic energy informatics framework, the yellow section of Fig. 2, and added details of the digital data streams (energy prices and solar radiation forecasts) and databases (plant details and production schedule) necessary to control the sensitized object (LED lighting). These four additional components illustrate how the core energy informatics information system can be extended for CEA. To understand the advantage of adaptive LED lighting, while leveraging the energy informatics framework adapted to the context of CEA, we ran three simulations with increasing levels of sophistication. The first simulation leverages LED adaptive lighting. The second incorporates a daily decision, where the adaptive lights are turned off for the day when the expected daily solar radiation exceeds the ETR that optimizes growth. As to the third simulation, it leverages “within day” decision making, where the adaptive lights are turned off when the target solar radiation for the day has been achieved. Note that whereas Fig. 3 suggests an energy price forecast, we assumed a fixed energy cost for the time being. Moreover, rather than solar radiation forecasts, we used historical solar radiation data for a specific location and period. Last, for sake of simplicity in this first set of simulations, we did not consider the cost of production schedule delays. We assumed 70% transmittance of the received solar radiation into the greenhouse. We compared the results of all three simulations to a baseline scenario, which involved non-adaptive LED lighting. This baseline scenario, along with the three simulations, are further detailed next. The greenhouse lighting layout assumes the use of 1,200 600W LED lights per hectare, capable of providing a PPF of 200 μmoles m−2 s−1 with all lights on at full power. Based on a recent survey of growers, we assume a typical greenhouse uses supplemental lighting for an average of 3.25 hours per day (nine hours in winter, two hours in fall and spring, and zero in summer). The annual cost for this level of LED lighting is .12*3.25*365.25*600/1000 = USD 85.47 per light per year. A one hectare greenhouse needs about 1200 lights, so the cost would be USD 102,562 per year. This scenario assumes that the lights can be dimmed to any PPF between 0 and 200 μmoles m−2 s−1, and the relationship between energy use and PPF is linear between 0 and 600W. At its peak, adaptive lighting consumes the same energy as non-adaptive lighting. We use these parameters for the simulation. Using solar radiation data collected in 10-minute intervals in Athens, Georgia in 2010–2014, we simulate the use of adaptive lighting by computing Tppf for lettuce and setting the lights to maintain the mix of natural and supplemental lighting at this level. As the threshold for Tppf in this case is 149 μmoles m−2 s−1, the adaptive lights were set to maintain this level. When there is sufficient natural light, the adaptive lights will consume 0W and when there is complete darkness, they will consume 149/200*600 = 447W. The cost of operating the adaptive lighting in 2010–2014 to grow lettuce for 20 hours per day is estimated to be USD 194.78 per light per year or for a one hectare greenhouse USD 233,738 per year. As expected, the lights are costlier to operate in winter than in summer (Fig. 3). We simulated a model that would inform the grower whether to turn the adaptive lights off for the day when the forecast solar radiation for the day exceeds the total required to achieve an ETR of D moles m−2 day−1 . Such an approach requires minimal investment and under a SaaS business model, the grower could be sent a text message on the recommended status of the adaptive lighting early each day. The cost of operating the adaptive lighting under daily decision making in 2010–2014 to grow lettuce with 20 hours of light per day is estimated to be USD 86.92 per light per year or for a one hectare greenhouse USD 104,302 per year, slightly above the baseline scenario. As to be expected, on many days there is no need to turn on the lights (Fig. 4). A major shortcoming of a daily decision making model is that the forecasted radiation for a day could be just below the threshold, but the lights are turned on for the entire day. Ideally, once the target for the day has been achieved, the lights should be turned off for the remainder of the day. We simulated such a model (Fig. 5), which shows that on some days the lights come on, but only for a short period with a corresponding lower cost. The cost of operating the adaptive lighting under this approach in 2010–2014 to grow lettuce for 20 hours per day is estimated to be USD 32.28 per light per year or for a one hectare greenhouse USD 38,732 per year, about one third of the baseline scenario. Under a SaaS business model, the within day approach requires that the grower invests in a lighting control system that can be controlled remotely. The controller would receive periodically a message to set the status (on or off) of the lights in the greenhouse. Thus, some of the energy savings will be lost to the operation and maintenance of a lighting control system, but we expect these to be minor compared to the energy use of the lights themselves. The simulations were written in R, and the code is in four modules (see Additional file 1). The main module (simulation.R) loads modules to read the parameters for a simulation (parameters.R) and prepares data for the simulation (prepare.R). Another module (report.R) reports the results for each of the simulations discussed previously. The simulations take advantage of R’s vector-oriented operations for operating on data frames, and a typical run with five years of data takes a few seconds. In comparison, an earlier loop-based version of the model took 10 or so minutes to run. The simulations require two binary input files, coded in R’s feather format, which are described in the appendix. The findings of the analysis show that only "within day" decision making will result in a reduction in total lighting cost compared to current manual practices (Table 1). Partial solutions, while they might deliver light precisely to ensure optimum plant growth, are likely to be subject to grower resistance because there is no cost advantage. Growers can save around 60% of the current cost of lighting by retrofitting their current LED lighting systems. Note that in the within day decision simulation, the lights are on half the time of the current manual or timer practice, but the electricity saving is higher because the adaptive lighting generally does not operate the lights at full power. The energy savings are similar in magnitude to those reported for DynaGrow, however the two sites are at different latitudes, with Denmark in the mid-50° and Athens, Georgia close to 34°, thus resulting in different light environments. To compute the ROI, we conservatively estimate that the cost of equipping a greenhouse with a single solar radiation sensor, control software, and connecting existing LED lighting to the control software is USD 100 per light with a lifetime of 10 years, or USD 120,000 for a one-hectare greenhouse. The computed ROI is 68% for within day decision making. If we triple the cost estimate to USD 300 per light, then the ROI is 14%. In effect, anything below USD 300 per light for retrofitting a greenhouse is financially sound and likely to provide additional benefits from exact contract fulfillment. Although the prior simulations are based on a fixed energy cost of USD 0.12 per kWh, we wrote the code so that it can also process a file of historical real-time electricity prices. Such pricing is typically available only to large consumers (e.g., a factory or a university). In this case, the within day simulation determines which time periods during the day are the least expensive for operating the lights in order to meet the daily ETR goal. Solar radiation and electricity prices are dependent on local conditions. In this situation, based on five years of solar radiation data measured at the University of Georgia, the average solar radiation is 5.22 kWh m−2 day−1. The University of Georgia is in the sunny Southeast U.S., and thus our results show the advantage of this additional solar energy. Also, the region has some of the cheaper electricity in the U.S. The U.S. average is USD .13 kWh, with a range of USD .10 to .29 kWh. Georgia, at USD .125, is towards the lower end of this range. If the simulations had been based on solar radiation in the Northeast, for example, savings would be different because of less solar radiation, more required supplemental lighting, and higher electricity prices. In essence, our results should be interpreted as being appropriate for a relatively sunny region with relatively cheap electricity. Our simulation framework can easily be used to simulate different locations. The main purpose of these simulations is to show the potential of using solar radiation and electricity cost forecasts to reduce the cost of operating a greenhouse. However, rather than forecasts, we have simulated the perfect information situation where electricity prices and solar radiation can be precisely predicted. As most greenhouses are too small to presently avail themselves of real-time pricing, treating the price of electricity as fixed is appropriate. Thus, in moving beyond perfect information, the focus needs to be on solar radiation forecasting. It can be argued that simulations represent a simplified reality. However, such simplicity means that they can be readily explained to a grower, which in turn is likely to increase the likelihood of adoption. The simple decision rules are very effective in reducing cost, and additional complexity is unlikely to be required or produce significant additional savings. Furthermore, the second and third simulations can be easily implemented from a central source using a SaaS model, which lowers the cost for adoption and maintenance. As mentioned earlier, by using historical data, we assume perfect information. Thus, the next step is to simulate the effects of solar radiation forecasts with varying degrees of accuracy to determine the sensitivity of the findings to forecast precision. We speculate that sensitivity will be low for two reasons: (1) the goal is to determine whether or not to turn on adaptive lighting for a set period, such as 10 minutes; and (2) a multi-period forecast for the remainder of day can be continually adjusted throughout the day. The essential problem, whether to turn the lights on or off for a set period, would seem to be a simpler problem than trying to forecast the level of radiation for the same period. Intelligent adaptive LED lighting provides the precision to ensure plants receive the necessary photons to meet growth goals, provided the LED light is on. We plan to build two forecasting models, one for the binary decision of LED light on or off and the second to forecast radiation levels. Based on prior research, it would appear that a neural network with allowance for autocorrelation is appropriate for radiation level forecasting, whereas logistic regression might be suitable for the binary decision. The goal is to deliver sufficient photons each day for a plant to reach its daily growth needs. Throughout a day, the forecast system must continually adapt to meet this target. As the forecast period becomes shorter, then adaption can be faster. Thus, one of the issues is to simulate the precision of the forecasting system to the length of the decision period (e.g., five versus 20 minutes). As we expect the computing cost of each forecast to be quite small and the communication cost of the on/off decision to each light to also be small, the selected time period might make little financial difference for an individual grower given the gains achieved by efficient management of LED usage. Nevertheless, these assumptions need to be validated. Since natural light conditions vary greatly among locations, it will also be important to run simulations for a range of regions, especially those where greenhouses most commonly use supplemental light, like Canada, the Northern U.S., and Northwestern Europe. We need to elaborate the simulation model to embrace more decision parameters, such as those considered in prior research, and apply photosynthesis theories that take account of light wavelength and the capability of controlling the wavelength of LED lighting. There is much to learn about LED lighting because it is a relatively recent introduction to the greenhouse environment. It enables control over spectral power distribution, optical intensity distribution, form factor, and active color tuning. It can be used, as in this study, to tailor light to a specific crop to improve productivity by controlling precisely the photons delivered to ensure threshold needs for growth are met. Other aspects of plant growth such as height, bushiness, and color or nutritional content are potential areas for research. This research simulates LED usage approaches to minimize electricity cost by applying prior research on threshold curves. It assumes that if a plant receives sufficient photons, or the right amount of light, to meet daily growth needs, the quality of the crop will be of commercial standard. Assessment of this assumption is a topic for future research, and the power of simulation is to help identify opportunities for fruitful research. This initial study of the application of energy informatics to CEA illustrates the potential to considerably reduce the energy required to operate a greenhouse. Our plans are to extend the research to cover other commercial crops (e.g., red leaf lettuce, spinach, basil, tomatoes, and cucumbers) as well as ornamental species, including high-light crops (roses, petunias, and marigolds) and low-light crops (impatiens, begonia, and hellebore). Moreover, we plan to consider four diverse regions of the continental U.S., because solar radiation varies greatly across this region (i.e., from an average of 3.0 to over 6.5 kWh m−2 day−1). This research shows the value of the energy informatics framework for addressing practical problems. It helps scientists communicate with growers by focusing on the three elements that are necessary for an information system to manage an energy flow. In the case of CEA, engaging growers will be critical to adoption of information-systems-augmented adaptive lighting. It also demonstrates the potential for using simulation to explore the effects of energy management options. The Lawrence Livermore National Laboratory publishes annually an infographic on energy use in the U.S. The 2016 version estimates that about two thirds of the energy generated is wasted. The application of energy informatics thinking to CEA illustrates that in some areas of the economy, significant energy efficiency gains can be achieved with simple solutions. We expect that CEA is not an exception and the launching of the journal Energy Informatics can potentially alert more scholars and practitioners to the synergistic gains of integrating engineering advances, such as adaptive lighting, and information systems to achieve higher levels of energy efficiency. Creating a sustainable society is dependent on engineering and IS scholars combining minds and knowledge. ↑ Which can be further subdivided into two types: metal halide and high-pressure sodium. ↑ Compounds of carbon, hydrogen, and oxygen. Sucrose is C12H22O11. ↑ One mol = 6.022 × 1023 (Avogadro’s constant) photons or electrons. Only the authors listed on the manuscript contributed towards the article. This research was supported by a University of Georgia Presidential seed grant. Drs. M-CB and RTW were responsible for the energy informatics simulation. Dr. MWvI provided the data on the saturation model for lettuce and details of plant physiology relevant for the simulation. All authors read and approved the final manuscript. electricity.feather: A binary file containing a timestamp and electricity price in cents per kWh. Measurements are hourly. radiation10.feather: A binary file containing a timestamp and incident solar radiation in Watts m−2 s−1. Measurements are for every 10 minutes, and derived from a file of measurements made every two minutes. These files must be stored in an R project working directory along with the R modules. The location of this working directory must be specified in the second line of parameter.R. ↑ Holden, J.P. (2009). "Energy for Change: Introduction to the Special Issue on Energy & Climate". Innovations: Technology, Governance, Globalization 4 (4): 3–11. doi:10.1162/itgg.2009.4.4.3. ↑ Gholami, R.; Watson, R.T.; Hasan, H. et al. (2016). "Information Systems Solutions for Environmental Sustainability: How Can We Do More?". Journal of the Association for Information Systems 17 (8): 2. https://aisel.aisnet.org/jais/vol17/iss8/2. ↑ Malhotra, A.; Melville, N.P. ; Watson, R.T. (2013). "Spurring impactful research on information systems for environmental sustainability". MIS Quarterly 37 (4): 1265-1273. doi:10.25300/MISQ/2013/37:4.3. ↑ 4.0 4.1 Watson, R.T.; Boudreau, M.-C.; Chen, A.J. (2010). "Information systems and environmentally sustainable development: Energy informatics and new directions for the IS community". MIS Quarterly 34 (1): 23–38. ↑ 5.0 5.1 Watson, R.T.; Boudreau, M.-C. (2011). Energy Informatics. Green ePress. ↑ Food and Agriculture Organization of the United Nations (12 October 2009). "Global agriculture towards 2050" (PDF). http://www.fao.org/fileadmin/templates/wsfs/docs/Issues_papers/HLEF2050_Global_Agriculture.pdf. ↑ Magnin, C. (August 2016). "How big data will revolutionize the global food chain". Digital McKinsey. McKinsey & Company. https://www.mckinsey.com/business-functions/digital-mckinsey/our-insights/how-big-data-will-revolutionize-the-global-food-chain. Retrieved 18 June 2018. ↑ 8.0 8.1 "CEA". CEA Capital Holdings LLC. 2014. http://www.ceacapitalholdings.com/education/sub-page/. Retrieved 18 June 2018. ↑ Technavio (13 July 2017). "Global Greenhouse Horticulture Market 2017-2021: Key Geographies and Forecasts by Technavio". BusinessWire. https://www.businesswire.com/news/home/20170713006114/en/Global-Greenhouse-Horticulture-Market-2017-2021-Key-Geographies. ↑ "Smart Greenhouse Market by Technology: Global Industry Perspective, Comprehensive Analysis and Forecast, 2016 – 2022". Zion Market Research. 18 January 2017. https://www.zionmarketresearch.com/report/smart-greenhouse-market. ↑ 11.0 11.1 van Iersel, M.W. ; Gianino, D. (2017). "An Adaptive Control Approach for Light-emitting Diode Lights Can Reduce the Energy Costs of Supplemental Lighting in Greenhouses". HortScience 52 (1): 72–77. doi:10.21273/HORTSCI11385-16. ↑ Aaslyng, J.M. ; Lund, J.B.; Ehler, N. et al. (2003). "IntelliGrow: A greenhouse component-based climate control system". Environmental Modelling & Software 18 (7): 657–66. doi:10.1016/S1364-8152(03)00052-5. ↑ 13.0 13.1 Markvart, J.; Kalita, S.; Nørregaard Jørgensen, B. et al. (2007). "IntelliGrow 2.0–A greenhouse component-based climate control system". Acta Horticulturae 801: 507–14. doi:10.17660/ActaHortic.2008.801.56. ↑ 14.0 14.1 Kjaer, K.H. ; Ottosen, C.-O. ; Jørgensen, B.N. (2011). "Cost-efficient light control for production of two Campanula species". Scientia Horticulturae 129 (4): 825-831. doi:10.1016/j.scienta.2011.05.003. ↑ 15.0 15.1 Kjaer, K.H. ; Ottosen, C.-O. ; Jørgensen, B.N. (2012). "Timing growth and development of Campanula by daily light integral and supplemental light level in a cost-efficient light control system". Scientia Horticulturae 143: 189–96. doi:10.1016/j.scienta.2012.06.026. ↑ 16.0 16.1 Clausen, A.; Maersk-Moeller, H.M.; Sørensen, J.C. et al. (2015). "Integrating Commercial Greenhouses in the Smart Grid with Demand Response based Control of Supplemental Lighting". Proceedings of the 2015 International Conference on Industrial Technology and Management Science. doi:10.2991/itms-15.2015.50. ↑ 17.0 17.1 17.2 17.3 Sørensen, J.C.; Kjaer, K.H. ; Ottosen, C.-O. et al. (2016). "DynaGrow – Multi-Objective Optimization for Energy Cost-efficient Control of Supplemental Light in Greenhouses". Proceedings of the 8th International Joint Conference on Computational Intelligence: 41–8. doi:10.5220/0006047500410048. ↑ Both, A.J. ; Albright, L.D. ; Langhans, R.W. et al. (1997). "Hydroponic lettuce production influenced by integrated supplemental light levels in a controlled environment agriculture facility: Experimental results". Acta Horticulturae 418: 45–52. doi:10.17660/ActaHortic.1997.418.5. ↑ NEMA Ballast and Lighting Controls (14 July 2015). "Energy Savings with Fluorescent and LED Dimming" (PDF). National Electrical Manufacturers Association. https://www.nema.org/Standards/SecureDocuments/NEMALSD%2073-2015%20WATERMARKED.pdf. Retrieved 18 June 2018. ↑ "State of Indoor Farming 2016". Agrilyst. 2016. http://stateofindoorfarming.agrilyst.com/. ↑ Wickham, H. (29 March 2016). "Feather: A Fast On-Disk Format for Data Frames for R and Python, powered by Apache Arrow". RStudio Blog. https://blog.rstudio.com/2016/03/29/feather. ↑ "Table 5.6.A. Average Price of Electricity to Ultimate Customers by End-Use Sector". Electric Power Monthly. U.S. Energy Information Administration. 2018. https://www.eia.gov/electricity/monthly/epm_table_grapher.php?t=epmt_5_6_a. ↑ Wollsen, M.G. ; Jørgensen, B.N. (2015). "Improved Local Weather Forecasts Using Artificial Neural Networks". Distributed Computing and Artificial Intelligence, 12th International Conference: 75–86. doi:10.1007/978-3-319-19638-1_9. ↑ Jørgensen, B.N. ; Mærsk-Møller, H.M. (2011). "A software product line for energy-efficient control of supplementary lighting in greenhouses". Proceedings of the Second International Conference on Innovative Developments in ICT: 37–46. doi:10.5220/0004471400370046. ↑ Rytter, M.; Sørensen, J.C.; Jørgensen, B.N. et al. (2012). "Advanced model-based greenhouse climate control using multi-objective optimization". Acta Horticulturae 957: 29–35. doi:10.17660/ActaHortic.2012.957.2. ↑ Sørensen, J.C.; Jørgensen, B.N. ; Klein, M. et al. (2011). "An Agent-Based Extensible Climate Control System for Sustainable Greenhouse Production". International Conference on Principles and Practice of Multi-Agent Systems: 218–33. doi:10.1007/978-3-642-25044-6_18. ↑ Pattison, P.M. (2017). "Foreward". In Gupta, D.. Light Emitting Diodes for Agriculture. Springer. pp. vii–ix. ISBN 9789811058073. ↑ Roberts, B.J. (19 September 2012). 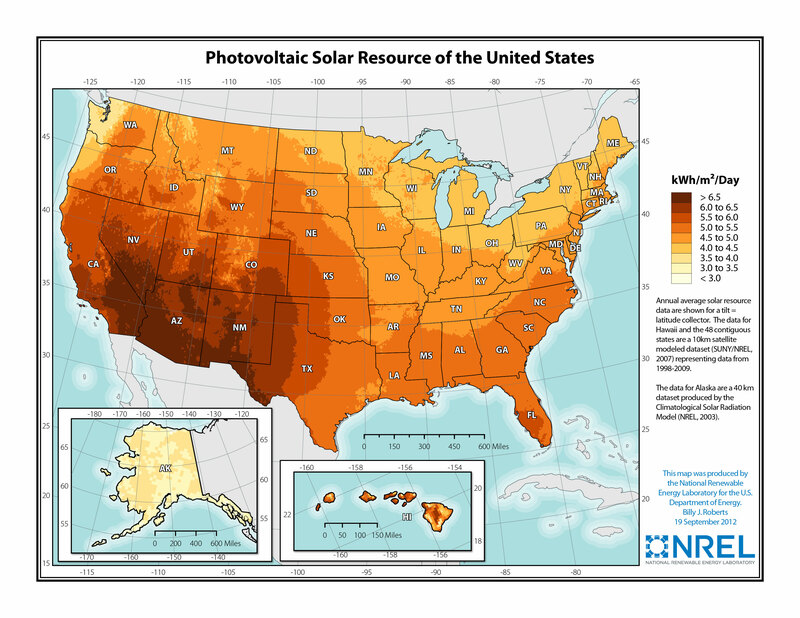 "Photovoltaic Solar Resource of the United States". National Renewable Energy Laboratory. https://azsolarcenter.org/images/articles/az/national_photovoltaic_map_2012-01.jpg. ↑ "2016: United-States". Energy Flow Charts. Lawrence Livermore National Laboratory. 2016. https://flowcharts.llnl.gov/commodities/energy. This presentation is faithful to the original, with only a few minor changes to presentation. In some cases important information was missing from the references, and that information was added. References in the original are listed alphabetically; they appear here in order of appearance, by design. The original article cited a Wikipedia page; replaced with URL and info for citation on that wiki page. To more easily differentiate footnotes from references, the original footnotes (which where numbered) were updated to use lowercase letters. Most footnotes referencing web pages were turned into proper citations. This page was last modified on 12 February 2019, at 22:38.